Neovascular age-related macular degeneration (known as wet AMD) is the leading cause of blindness in the elderly1 and is characterized by proliferation and leakage of abnormal blood vessels in the eye.2 Vascular endothelial growth factor (VEGF) is one of the most important cellular factors promoting the growth and proliferation of blood vessels, and has therefore become the major target for wet AMD therapies. Ranibizumab (Lucentis®), bevacizumab (Avastin®), both of which target VEGF-A; pegaptanib (Macugen®), a selective inhibitor of VEGF165; and aflibercept (Eylea®), which inhibits VEGF-A as well as placental growth factor (PGF)3 have become established treatments for wet AMD, although bevacizumab is not licensed for ophthalmic use. These anti-VEGF drugs are injected into the vitreous, where they bind to abnormal VEGF proteins and prevent them from stimulating further blood vessel growth and leakage. 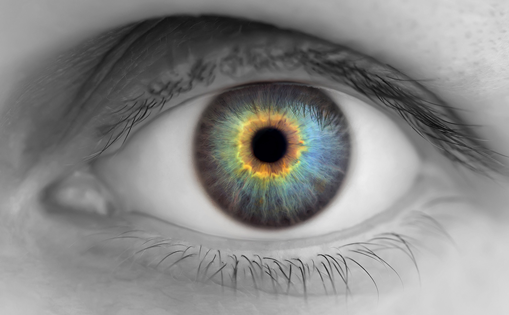 However, regular intravitreal injections are burdensome for patients and practitioners. 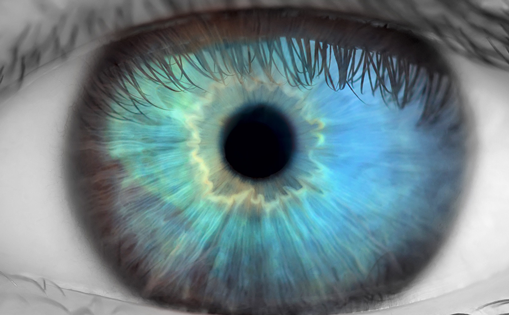 Furthermore, a proportion of patients do not respond to anti-VEGF therapies, and treatments become less effective with repeated intravitreal injections.4 This has prompted a search for novel therapeutic targets. As our understanding of the molecular processes underlying wet AMD has increased, it has become clear that, in addition to VEGF, other factors, such as platelet-derived growth factor (PDGF), may participate in the control of the angiogenic process. 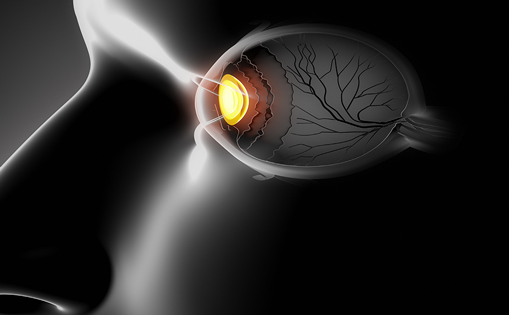 A growing body of evidence suggests that dual inhibition of VEGF and PDGF may be more effective than targeting VEGF alone. Tumor models have shown that angiogenesis involves both VEGF and PDGF activity.8In addition, PDGF is involved aspects of wet AMD pathology, such as fibrosis. 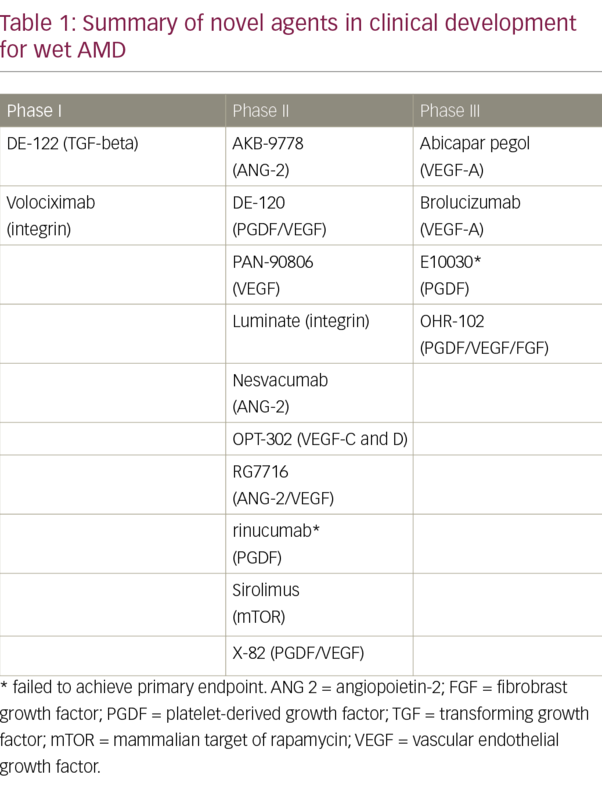 However, several of these agents in advanced clinical development have failed to show any benefits when added to established anti-VEGF-A agents: these include E10030 (also known as pegpleranib, Fovista®, Ophthotech) and rinucumab (Regeneron). Despite these disappointing findings, the clinical development of other PGDF inhibitors is continuing, including DE-120 (Santen) and X-82 (Tyrogenex)9 which block both PDGF and VEGF, and OHR-102 (squalamine®, Ohr Pharmaceuticals), which targets intracellular calmodulin to inhibit the downstream effects of VEGF, PDGF, and basic fibroblast growth factor, and has shown promise in combination with ranibizumab.10 The latter two have attracted particular attention since X-82 is administered orally and OHR-102 is applied topically (see Table 1). Finally, transforming growth factor-beta has emerged as a useful therapeutic target as it promotes escape from VEGF inhibition in endothelial cells. DE-122 (Santen), a transforming growth factor-beta inhibitor, is being investigated in combination with anti-VEGF agents. 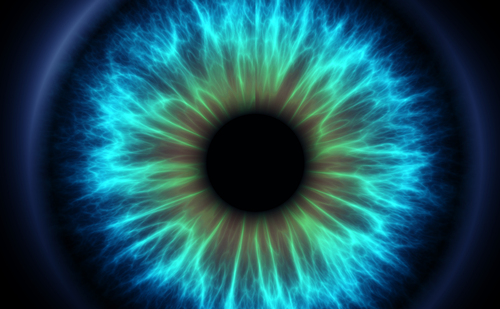 In summary, although anti-VEGF treatments have transformed the treatment of wet AMD, they are far from perfect and there remains a need for novel molecular targets to overcome the non-responsiveness, observed in some patients, to anti-VEGF treatment. 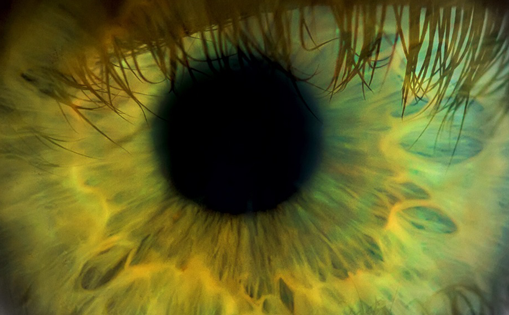 However, the numbers of investigational agents that have failed late-stage clinical development illustrate the challenges of wet AMD therapy. Intravitreal injections with current anti-VEGF medications are likely to remain the standard treatment for wet AMD for the foreseeable future. However, emerging therapies have the potential to reduce the injection frequency, as well as improving visual outcomes. If these novel therapeutic options are marketed, it will also become important to better characterize patients to tailor treatment to the individual. 1. Friedman DS, O’Colmain BJ, Munoz B, et al., Prevalence of age-related macular degeneration in the United States, Arch Ophthalmol, 2004;122:564-72. 2. Jager RD, Mieler WF, Miller JW, Age-related macular degeneration, N Engl J Med, 2008;358:2606-17. 3. Dixon JA, Oliver SC, Olson JL, et al., VEGF Trap-Eye for the treatment of neovascular age-related macular degeneration, Expert Opin Investig Drugs, 2009;18:1573-80. 4. Ehlken C, Jungmann S, Bohringer D, et al., Switch of anti-VEGF agents is an option for nonresponders in the treatment of AMD, Eye (Lond), 2014;28:538-45. 5. 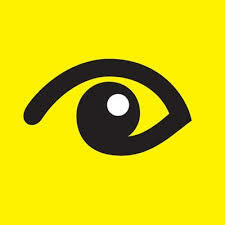 Maturi R, Abicipar Pegol (Anti-VEGF DARPin) Phase 2 Study in Patients With Neovascular Age-Related Macular Degeneration. Presented at the American Society of Retinal Specialists (ASRS) Annual Meeting, Aug 9-13, 2014, San Diego, CA. 6. Bandello F, Weichselberger, A., Weissgerber, G., et al, Safety and efficacy of RTH258, a single-chain anti-vascular endothelial growth factor (VEGF) antibody fragment, in patients with neovascular age-related macular degeneration (NAMD): results from 2 phase II studies. 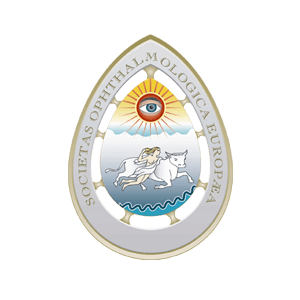 Presented at: European School for Advanced Studies in Ophthalmology Retina Academy; October 22-24, 2015; Barcelona, Spain. 7. Opthea Reports Positive Phase 1/2A Clinical Results for OPT-302 in wet AMD http://www.marketwired.com/press-release/opthea-reports-positive-phase-1-2a-clinical-results-for-opt-302-in-wet-amd-asx-opt-2207063.htm Accessed 12 April 2017. 8. Bergers G, Song S, Meyer-Morse N, et al., Benefits of targeting both pericytes and endothelial cells in the tumor vasculature with kinase inhibitors, J Clin Invest, 2003;111:1287-95. 9. N. C, Oral VEGF receptor/PDGF receptor inhibitor X-82, Presented at: the American Academy of Ophthalmology Annual Meeting; November 14-17, 2015; Las Vegas, NV., . 10. Wroblewski JJ, Hu AY, Topical Squalamine 0.2% and Intravitreal Ranibizumab 0.5 mg as Combination Therapy for Macular Edema Due to Branch and Central Retinal Vein Occlusion: An Open-Label, Randomized Study, Ophthalmic Surg Lasers Imaging Retina, 2016;47:914-23. 13. Campochiaro PA, Khanani A, Singer M, et al., Enhanced Benefit in Diabetic Macular Edema from AKB-9778 Tie2 Activation Combined with Vascular Endothelial Growth Factor Suppression, Ophthalmology, 2016;123:1722-30. 14. Ishikawa M, Jin D, Sawada Y, et al., Future therapies of wet age-related macular degeneration, J Ophthalmol, 2015;2015:138070.